Whether it's Halloween or you're just in that kind of mood, illuminate the darkness with this cool new Midnight Noir Candle Set . 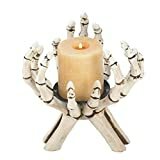 This macabre candle holder is held up by a spooky skeleton hand and features a 10 ounce matte black faceted glass candle that burns up to 50 hours and has an earthy cedar and citrus scent. If gifting, it also comes in a wooden crate, although a pine coffin would have been even cooler. 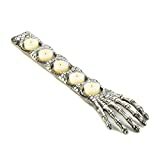 Also makes an appropriate gift for doctors and mad scientists. 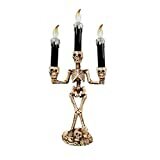 Ebros Gothic Skeletal Hand Candle Holder Figurine 10.5"